A woman's breasts undergo vast changes during pregnancy. Our mission is to help new-moms feel comfortable and relaxed with their changing bodies by designing comfortable, flexible, supportive and functional bras. We have taken into consideration that women's breasts can increase by 2 cup sizes between nursing's, and that it is imperative during pregnancy & nursing that milk ducts are not restricted. Soft cup style nursing and maternity bras are highly recommended by lactation consultants. Why choose Carriwell's Seamless Maternity Bra? The wide straps add to comport and support. Perfect to wear under t-shirts due to the smooth, invisible design. Large sports style back supports the middle back which reduces pressure on the straps. 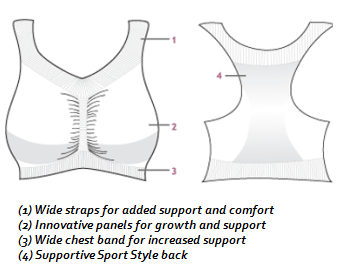 Similar in design to sports bras, it ensures support and total wearer-comfort, with no seams, hooks or wire that could pinch or hurt delicate breast tissue. The wide under band substitutes under wire resulting in extra support & "lifting" of the breasts.